Showing the unusual, detachable, battery holder. Distinctive features: A calculator from Unicom. 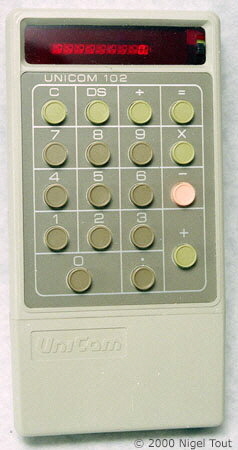 The company was taken over by Rockwell before it launched its own range of calculators. 75 mm x 146 mm x 23 mm (3" x 5.75" x 0.9"). Unicom Systems, Sunnyvale, CA USA. Significance: Unicom was started by the American semiconductor company American Microsystems Inc. (AMI). AMI integrated circuits were also used by several other calculator manufacturers. 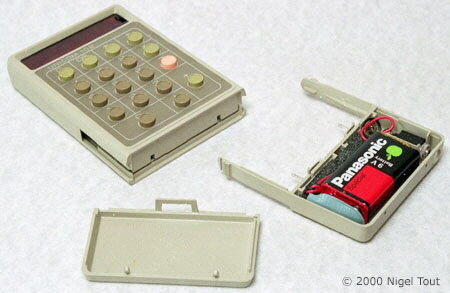 In 1972 AMI was bought by Rockwell and the Unicom name soon disappeared to be replaced by the Rockwell name on a line of very successful calculators, such as the Rockwell 8R. Rockwell exited the consumer electronics market in the late 1970s.